In ancient Greek mythology, Cassandra was a beautiful woman. She was the daughter of Hecuba and Priam; she could tell the future and had visions of what was to come. However, legend has it that when Cassandra rejected Apollo’s advances, he cursed her. Apollo’s curse meant that no one would ever believe her true prophecies. She spent her life with people thinking she was insane! Her brother, however, they would believe. Poor woman! Well, she might not be able to tell you the future now or when you’ll win in this slot game, but she certainly can help you win. In Changing Fate 40, Cassandra is the Wild symbol. There’s also a magical Wild symbol that can help you get up to 80 Free Games! These come with a special ‘Changing Fate feature’. Changing Fate 40 has 5 reels and, you guessed it, 40 paylines! The ancient Greek theme can be felt all throughout the slot. The symbols especially make this theme come alive! 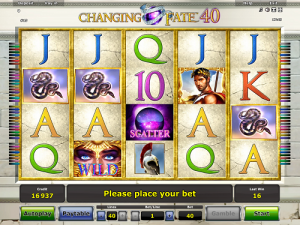 Changing Fate 40 is a Novomatic video slot game and has all their signature extras, like gamble and autoplay. It also has some of their signature sounds, as well as some epic classical-inspired music! Any fan of Greek mythology will be into this game. Similar slots from this developer include: Book of Ra Deluxe, Haul of Hades, Helena and Zenia Queen of War. As with any other slot game from Novomatic, or any other developer, it’s all about the symbols! The fate of the symbols will determine how much or how little you win! There are 40 paylines so 40 possible paths for the symbols to take – that is if you have them all active! Bet on as many paylines as you like, just one, ten, twenty-three or all forty! Symbol payouts are given for x3, x4 and x5 matches. Payouts are only given when the matching symbols fall in the right places! They have to fall consecutively; they have to land on a payline; and they have to fall from the left-hand side towards the right. 10, Jack, Queen, King and Ace symbols represent playing cards! These symbols will be very familiar to Novomatic casino fans as they turn up in many of their slot games. They have the lowest payouts of all the symbols in the game. Going up the pay scale, you’ll find some ancient Greek artefacts! These come in the form of a Spartan helmet and a Spartan shield. The snake symbol pays almost double the amount of these and then the Spartan soldier is the symbol with the biggest payouts. You can gamble your wins and play in autoplay. Cassandra, the prophesier, is the Wild symbol! She has the power to change fate by standing in place for any other symbol. Having this power enables her to help you get more wins! There might be 40 paylines in this game but you can get 80 Free Spins! The Scatter symbol is the only symbol that Cassandra cannot replace. This is a magical, purple orb is the Scatter symbol! This is the only symbol that can give you Free Games – up to 80 in fact! The number of Scatters you spin will determine how many Free Games you get. They also need to land from left to right but they can land on any position, for example 4 scatter symbols in the first reel and one in the second reel will trigger the Free Games. The minimum number you’ll get is 5 and the maximum is 80. No matter how many Free Games you win, they’ll all come with the Changing Fate Bonus! During the Free Games, the symbols become stacked. These stacked symbols are covered by shields so that you can’t see what they are! Underneath the shields can be any symbol at all! Only after the reels have stopped spinning will the shields be removed and the stacked symbols will be revealed! The stacked symbols in the Free Games mean crazy wins! Come and play Changing Fate 40 and see what fate (and Cassandra) has in store for you!